Are you looking for some help recording and maintaining all of your human resource documents? Are you drowning in paperwork and looking for a way out? Here are some guidelines to make organizing and maintaining your records a little bit easier. A company’s human resource department has one main goal. They maintain their records by preserving current employee documents and they get rid of old ones. These records keep track of everything from pre-employment interviews to I-9 forms to health records to coworker complaints. Basically, think of human resource records as a written history of every employee’s time with the company from beginning to end. So your purpose, as an HR employee, is to be the record keeper of these histories. To take things a step further, not only is it your responsibility to maintain this collection of records, but it’s the responsibility of you and your entire human resources department to analyze these records so that you can decisions that will improve the company’s work. HR departments decide what records they need to keep, and what records they can get rid of, based on company policies and the law. When you consider the sheer volume of records an HR department has to keep, and for how long it has to keep them, it’s pretty obvious why the number one complaint among HR professionals is that they have a hard time dealing with all of their paperwork. How are you supposed to achieve your purpose with so much paperwork to organize? How are you supposed to know what goes where and for how long? How can you possibly analyze these documents if you’re spending all of your time trying to find a way to organize and maintain them? Understanding a bit more about the types of documents you’ll manage and their goals might help make this whole process a bit easier. You’ll see a lot of records in human resources. But these records will all fall into different, general categories. Each of these categories has a different purpose or goal. Once you understand which documents your department collects and for what reason you collect them, it’s easier to see how all of the pieces fit together. It also makes organizing them easier. 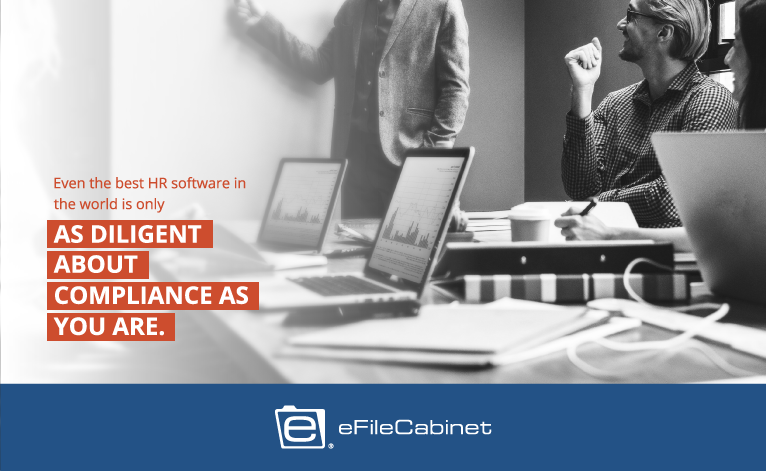 With a solid document storage software like eFileCabinet, you can set up certain types of files to auto-populate specific documents. That way, you can spend more of your time analyzing your documents instead of finding a place to put them. It’s important to remember that, while you should analyze these documents for the betterment of your company and its employees, these records need to be confidential and compliant with the law. Even the best HR software in the world is only as diligent about compliance as you are. There are federal laws and state laws that will affect how long you have to keep certain documents for, as well as, who can access what. Make sure your department is compliant with both so the company does not run into legal troubles. That’s why eFileCabinet allows you to automatically set who can see or manipulate documents that you have on file. That way, you only have to set those permissions once and eFileCabinet will set those permissions automatically for you every time. Using this feature, everyone who should and could have access to this information can access it without breaking compliance. Additionally, you’ll never have to think about compliance again, unless there’s a change to the law. If you understand the law, and you understand the purpose or goal of your documents, you’re ready to set up a human resource record-keeping system. Here are some other suggestions, however, to help you make your job easier. If you’re able to organize your documents in a way that checks off these boxes, while remaining compliant, you can then focus on improving engagement and other company processes. 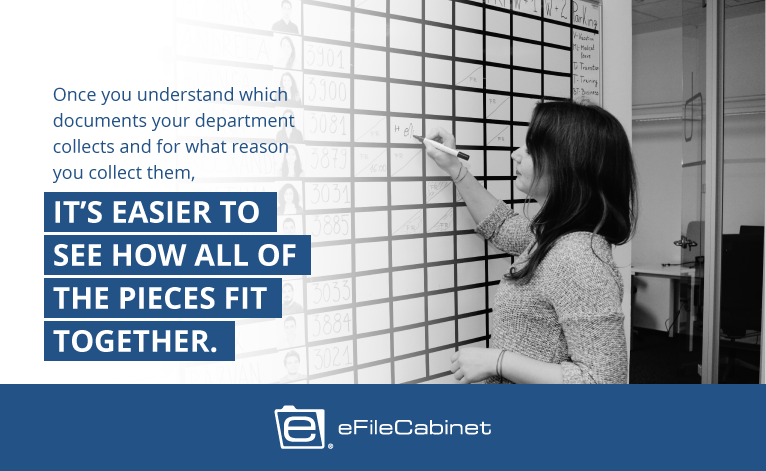 eFileCabinet can help automate most of this work so you can spend more time engaging your employees. Our Zonal OCR will help you digitize your documents minimizing the time it takes to find them as well as the cost to store them. Our automated workflows will set up compliance permissions and notify the right people when they need to authorize paperwork. Our folders will auto-populate documents so you can analyze them instead of making them. 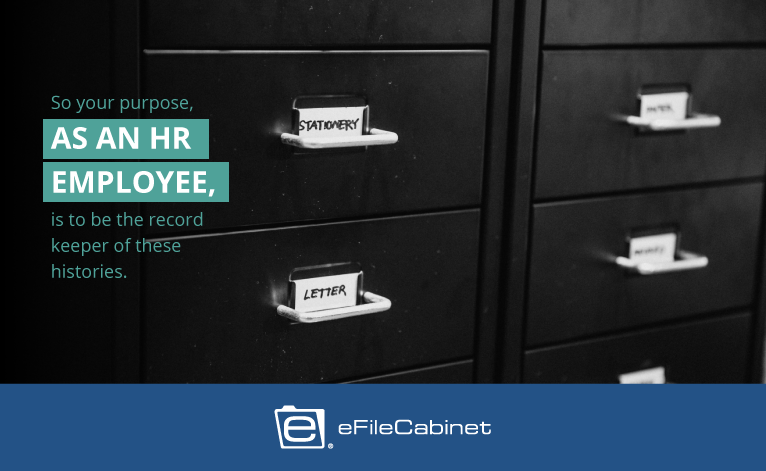 At eFileCabinet, we believe human resources should spend their time analyzing documents instead of organizing them. Download our free ebook today, so you can learn more about how we help you help your company.